Opened on July 2008, the App Store is now 4 years old. As of today, it has 600,000 active apps and 65,000 among them are books. If we take the very best of them, e.g. 0.01%, we would end up with a list of six books that are the best of them all. I haven't found all six, but I believe I have found one of them. Today, I will share about a storybook that is in a class of its own, built in the same production settings as the Academy Award winner for Best Animated Short Film, The Fantastic Flying Books of Mr. Morris Lessmore. A creature of habit, Every morning Morris Lessmore would write in his journal. Morris Lessmore was a young man who loved words, stories and books. Every morning, he would wake up to write his joys, sorrows and hopes in his personal journal. One day, as he sat on his balcony, a hurricane struck and blew away all his belongings. His house, his books and even the words in his journal were gone. As Morris wandered around and tried to figure out what he should do next, he looked up the sky. To his amazement, he saw a lady was drifting by, pulled by a squadron of flying books. Morris threw his journal up in the air to see if it would fly too, but apparently it couldn't. Just then, the flying lady gave away her favorite book, Humpty Dumpty, to Morris. Humpty Dumpty was a special book. He had feet and could display emotions through various drawings in his pages. He also led Morris to an extraordinary building where many flying books nested. The books invited Morris to read them, so he did. Every day, he would come to read and take care of them. He fixed the old ones. He also played, sang and danced with them. Until one day, Morris began to write again. His journal, which was made empty by the hurricane, came back to life as Morris began to write everything that he knew and hoped. He also shared many of the books with the people who lived nearby, making their lives colorful with new imaginations. After many years, Morris grew old. The books took care of him and read him stories every night. As he got ready to write the last few words in his journal, he knew that it was time for him to move on. He said goodbye to the flying books on the next morning and they flew him away just like the lady that he met many years ago. His journal now became one of the flying books inhabitating the building. Morris Lessmore's story took a turn for the better after encountering a mysterious lady being pulled along by flying books. Morris Lessmore is a character made by William Joyce based on his mentor, William Morris, a man who dedicated his life to books. Joyce wrote the story as he sat on an airplane to visit Morris, who died a few days after the story was read to him. Both Joyce and Brandon Oldenberg, the producers of this storybook app, wanted to create a tale that can illustrate the power of stories and how they can change your life. They believe that stories inspire the way we live our lives. The character design for Morris Lessmore took inspiration from Buster Keaton, an American comic who had a successful TV career back in the 1950s. Like Keaton, Morris sports a pork pie hat and moves the same way as the comic did when he performed in his shows. The storyline was also highly inspired by the Hurricane Katrina that had a huge impact on the people of New Orleans, Louisiana. The producers ended up using New Orleans as the setting for the story and used the hurricane as a symbol of people who are beginning their stories again just like Morris Lessmore. Morris Lessmore becomes the caretaker of an extraordinary building filled with all kinds of books. 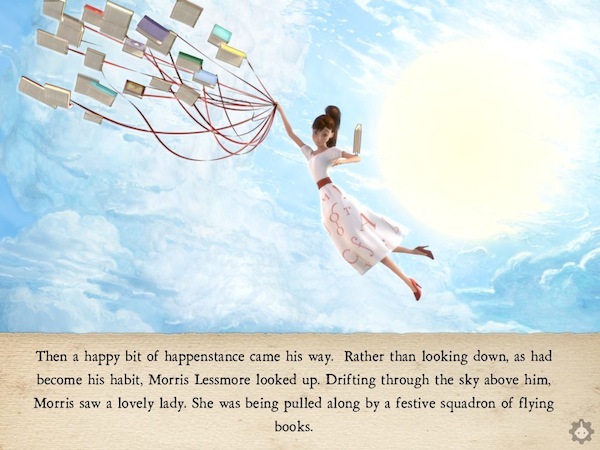 The Fantastic Flying Books of Mr. Morris Lessmore is a great app that features an inspiring storyline and a loveable character that everyone can relate to. A highly polished app, it has beautiful artwork, excellent musical store and top notch animations. All the features that you would expect from a modern storybook app are also available in this app, including mini games and great interactivity. If you look at the app, you will see that great efforts went into the production of the story. The crew of Moonbot Studios are really a talented bunch of folks. Finally, if you are like Morris Lessmore and enjoy the company of real books, do check out the physical copy and the trailer of the short film as put on their website. The physical storybook would work incredibly well with the special Augmented Reality app, entitled IMAG-N-O-TRON, that the developers have created to make the book comes to life. Regardless how old you are, you will love this book. It's a great story that you would want to share with the people you love, especially your juniors. I highly recommend this app. I am ordering the physical book from Amazon too. I also highly recommend you to watch the entire short film once you have purchased the app. It's breathtaking. I can't wait to see the next big thing that William Joyce would bring.